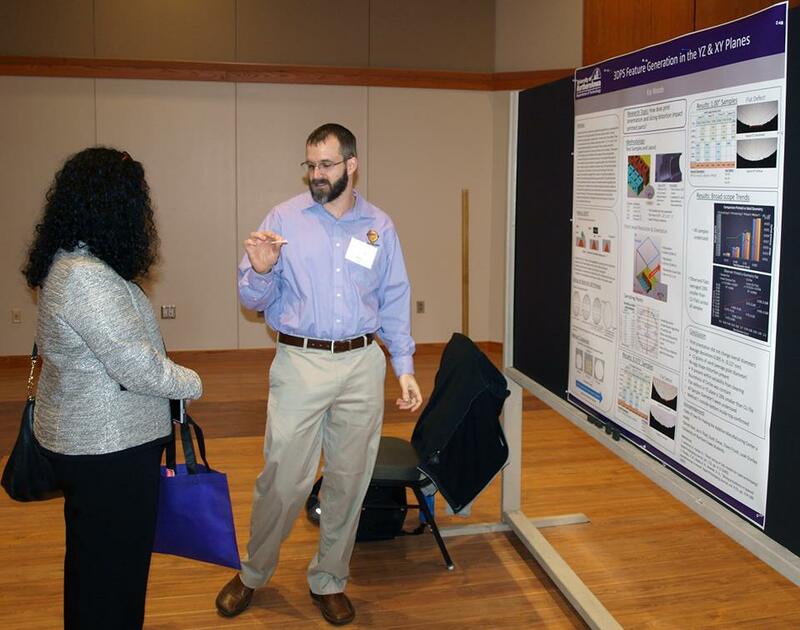 In April 2017, MCC's Kip Woods, presented at the University of Northern Iowa's Graduate Symposium and was awarded third place for his presentation, 3DPS Feature Generation in the YZ & XY Planes. Kip is currently completing his Master's degree in Technology under advisor, Dr. Scott Giese. Several trials were conducted on printed test geometry to understand the attributes of surface generation of 3D sand printers better. The test geometry analyzed was a square with a circular void in the middle. These circles were fixed at four different diameters (3/8”, 1/2”, ¾”, and 1”) and were printed horizontally and vertically. These samples were then evaluated on overall size, accuracy, precision and roundness. The purpose of this research was to determine the impact of the input geometry computer file had on the printed outcome. The computer files used for the horizontal circles contained an egg shape defect due to the layer-by-layer creation process of additive manufacturing. The horizontal samples did experience a flat defect at the start and finish layer of the circle, however, this defect averaged 28% smaller in the printed samples than within the computer generated input geometry file. The vertical printed circles experienced a lower amount of deviations when compared to the horizontal ones. Therefore the horizontal samples did contain a defect as the input file contained, but not to the extent of compromising the overall shape of the print. The improved surface generation for the vertical samples was attributed to the greater print head resolution in the X & Y axis compared to the Z axis.